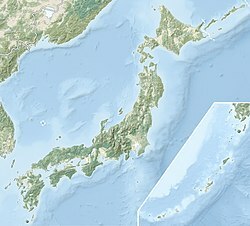 The 2005 Miyagi earthquake struck the east coast of the Japanese island of Honshū at 11.46 am (02:46 UTC) on August 16, causing casualties, building collapses and power outages. The event registered 7.2 on the moment magnitude scale. The earthquake occurred on Tuesday, August 16, 2005, and affected Japan's northeastern coast. It triggered a tsunami warning, and buildings shook 200 miles away in the capital, Tokyo. It was initially estimated to have a rating of 6.8, and the United States Geological Survey later declared it as a 7.2. A tsunami warning was initially raised by the Japan Meteorological Agency, but was lifted after only two small waves several centimeters high hit shore. Casualties included those killed because of a pool roof collapse in Sendai city, Miyagi prefecture. Initial reports indicated 80 people were injured, but it was later reported by state broadcaster NHK that one person was seriously hurt and thirteen were slightly injured. Seventeen thousand people lost power. Twenty percent of the world's earthquakes are centered on Japan. The Japanese have been developing systems for early warning of earthquakes. For people of the city of Sendai who were testing the new earthquake warning system, they received a warning of the earthquake from the Meteorological Agency 16 seconds before it reached the city, providing time to take cover. People in Tokyo received a message one minute before it hit. Such technology has since become much more popular and this quake is credited for that, since it was 60 miles off the coast of Japan and there was time for a warning. Business resumed within a day. Japan's Earthquake Research committee said that the earthquake was not the big one that was predicted to strike in the next 30 years. Onagawa Nuclear Power Plant was shut down, with reactor-1 restarting Jan 2006, 2 on March 2006, 3 in 2007. ^ "Magnitude 7.2 – NEAR THE EAST COAST OF HONSHU, JAPAN". U.S. Geological Survey. August 16, 2005. Archived from the original on December 18, 2009. Retrieved June 20, 2006. ^ a b "Earthquake rocks northern Japan". BBC. August 16, 2005. Archived from the original on June 13, 2006. Retrieved June 20, 2006. ^ McNicol, Tony (April 13, 2006). "Japan Lays Groundwork for National Earthquake Warning System". Japan Media Review. Archived from the original on February 26, 2010. Retrieved June 20, 2006. ^ Kanamori, Hiroo; Miyazawa, Masatoshi; Mori, Jim (2006). "Investigation of the earthquake sequence off Miyagi prefecture with historical seismograms" (PDF). Earth Planets Space. 58 (12): 1533–1541. Bibcode:2006EP&S...58.1533K. doi:10.1186/BF03352657. Archived from the original (PDF) on June 4, 2010. Retrieved May 28, 2010. ^ "Nuclear Power Plants and Earthquakes - World Nuclear Association". Kanamori, H; Miyazawa, M; Mori, J (2006). "Special Section for the 2005 M7.2 Miyagi-oki earthquake". Earth Planets Space. 58 (12): 1533–1597. Bibcode:2006EP&S...58.1533K. doi:10.1186/BF03352657. Wikimedia Commons has media related to 2005 Miyagi earthquake.